At the beginning of "Pudd'nhead Wilson" a young slave woman, fearing for her infant's son's life, exchanges her light-skinned child with her master's. From this rather simple premise Mark Twain fashioned one of his most entertaining, funny, yet biting novels. On its surface, "Pudd'nhead Wilson" possesses all the elements of an engrossing nineteenth-century mystery: reversed identities, a horrible crime, an eccentric detective, a suspenseful courtroom drama, and a surprising, unusual solution. Yet it is not a mystery novel. Seething with the undercurrents of antebellum southern culture, the book is a savage indictment in which the real criminal is society, and racial prejudice and slavery are the crimes. 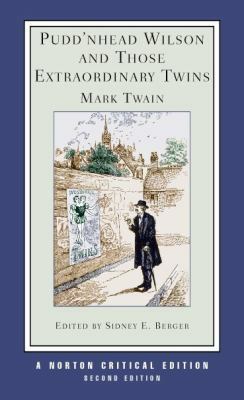 Written in 1894, "Pudd'nhead Wilson" glistens with characteristic Twain humor, with suspense, and with pointed irony: a gem among the author's later works.Twain, Mark is the author of 'Puddn'head Wilson And Those Extraordinary Twins ', published 2004 under ISBN 9780393925357 and ISBN 0393925358.